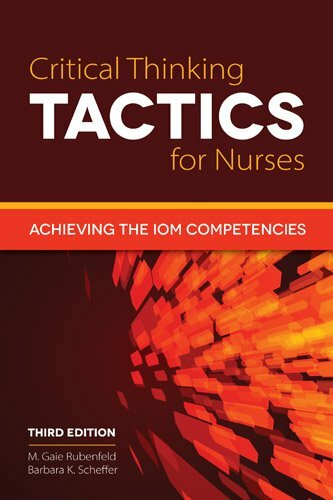 1284041387 -Critical Thinking TACTICS for Nurses: Achieving IOM Competencies, Third Edition is a user-friendly and practical manual focusing on the day-to-day realities of doing, learning, and evaluating critical thinking in nursing. With clear examples of both the parts and the whole of this complex process, each chapter includes action learning activities to promote critical thinking: Tracking, Assessing, and Cultivating Thinking to Improve Competency-based Strategies or TACTICS. Issues addressed include critical thinking language and awareness enhancement, the impact of critical thinking on quality care, mentoring the critical thinking of staff and students, and designing performance criteria for critical thinking. Based on the authors’ research in both defining and assessing critical thinking in nursing, this text also draws from their years of refining critical thinking teaching and learning methods. Completely updated and revised, the new edition offers critical thinking components combined with the Institute of Medicine’s (IOM) five core competencies: patient-centered care, interdisciplinary team work, evidence-based practice, informatics, and quality improvement. New to this edition are updated case studies, new illustrations, new content on how to facilitate synthesis of high level critical thinking, additional content on critical thinking within the nursing process, increased TACTICS, and new appendices to assist with the assessment of critical thinking.